Opening Reception: Thursday, December 6, 2018, from 6 – 9:30 P.M. Artist Talk: December 9 and 15, 2018, from 2 – 5 P.M.
Wednesday – Sunday from 1:00 – 6:00 P.M. Titled “Riders on the Storm”, solo exhibition at Gallery 1313, encompasses awareness and concerns of storms, tsunamis and dying coral reef related to human actions and consciousness impacted by consumerism and evolution of technology. As an answer to unrelenting alterations of the rhythms in nature, the Earth reacts with mass destruction, causing us loss of material possessions and the loss of life, ultimately forcing us to bring back basics of life. Facing this existential threat, how can we alter and change ourselves? Time is running out. Toronto artist Tatjana Hutinec pushes the boundaries of pictorial representation through various approaches of metaphorical self-expression. Tatjana believes that art can inspire us to achieve deeper awareness focused on relationships (instead of consumption) and help us grow and evolve consciousness of positive practices to prevent cataclysmic climate changes. Hutinec studied art at The School of Applied Arts and earned a Design degree at the University of Zagreb, Croatia. Displaced due to the war in Croatia In1990, Tatjana found opportunities for work in Toronto’s film and theatre industry creating and painting special effects costumes and sets, along with teaching art workshops at schools and communities. 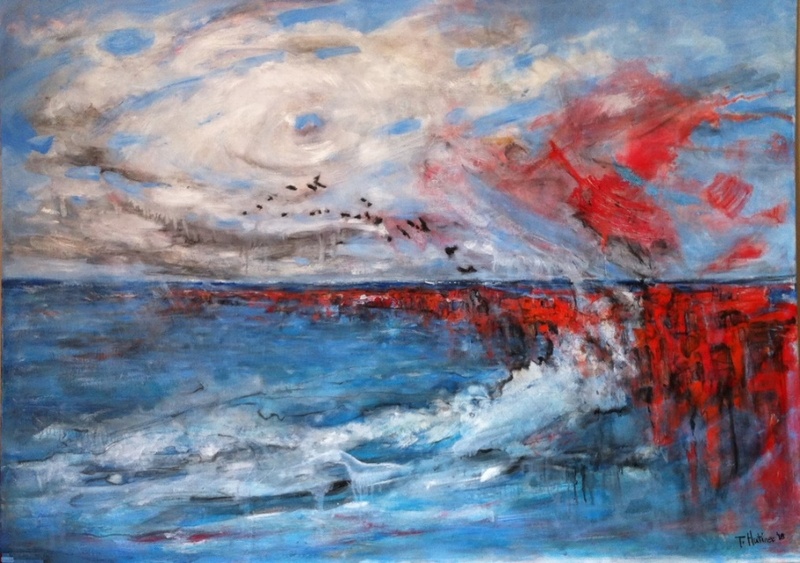 Tatjana has been exhibiting her artwork at galleries and events in Croatia and Canada. Public commissions include sculptures for Luminato – Harbourfront and paintings for City of Toronto – Street Art. Her work was featured on TV, in newspaper and books.